Chock, chock, chock, chock …. A metronomelike chirp resounded through the forest in Arizona’s Chiricahua Mountains. The sound was so similar to a bird call that it puzzled us at first. What is it, we wondered. Doesn’t it ever shut up? For several minutes we peered into the gloom, watching and shifting position until we were far enough apart to triangulate on the sound. We finally located the critter; it was a chipmunk perched next to the trunk of a tree. Chock, chock … you would have thought that its vocal cords were connected to its rear end, because – without fail – every repeat of its call was accompanied by a sharp jerk of its tail. You’ll find at least one species of chipmunk nearly everywhere in the United States and Canada. The Eastern chipmunk is the only species native to most of the eastern half of the United States; nearly all of the other species live primarily in the West. Why are there so many species of chipmunks in the West? The answer is ecological isolation. For example, eight different species reside in California’s Sierra Nevada. Identification depends upon subtle distinctions of size, color, voice, and habitat; so, most of us won’t know or care whether we’ve spotted a montane, lodgepole, alpine, or Townsend chipmunk. But the chipmunks do. Different species sort themselves out by elevation and location, so that one species lives only on the western slopes of the mountains and the other dwells solely on the eastern side. Where the territories of two or more species overlap, each tends to remain in its preferred foraging areas, such as dense trees and rocky outcrops or brushy thickets and debris. Because it is sometimes confusing to understand what a chipmunk is, let’s pause to differentiate between them and their near relatives. Chipmunks are much smaller than tree squirrels, so they’re pretty easy to distinguish. You can also discern chipmunks from ground squirrels by the presence and location of striping. Three dark and two light stripes run along the side of a chipmunk’s face, and five dark and four light stripes embellish its back and sides. These body stripes are quite prominent on most species, except for cliff chipmunks (such as the one that we searched for so diligently in Arizona), which aren’t quite as easy to identify. Only their bright face stripes proclaim their membership in the clan. The golden-mantled ground squirrel is often called a chipmunk, and, while its fur has bright body stripes, this handsome critter is substantially larger and lacks the essential stripes on its face. Chipmunks are provident creatures that store vast quantities of nuts and seeds in underground granaries. At times they merely dig a small hole to serve as a seed cache, fill it, and then tamp down the earth to conceal it from prying eyes. At other times they build warehouses within their living quarters. Either way, the food in these caches is intended to help the chipmunk survive during brief periods of waking in the winter and immediately after it emerges from hibernation. Depending upon the climate, chipmunks may hibernate during the winter and/or estivate (enter a state of lethargy) during the summer. Those that hibernate take to their burrows near October and “reactivate” in March or April. Chipmunks are called partial hibernators, because they don’t store up body fat. Although their breathing rate slows and their body temperature decreases during hibernation, they must “rev up their engines” every now and then and eat a hearty meal. Chipmunks spend most of their time gathering food. They eat themselves plump on one food source and then switch to a new one when the old one runs out – or when a new one becomes available. 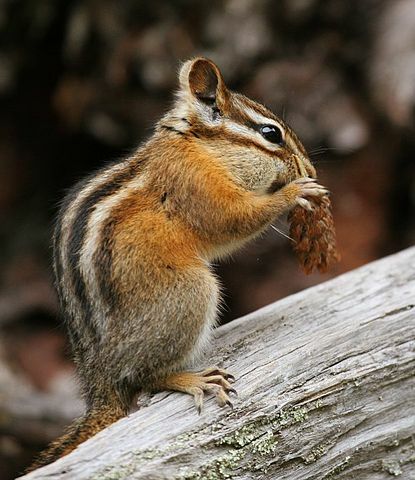 Pine nuts, acorns, blackberries, blueberries, and grass seeds make up a major portion of the chipmunk’s diet; however, they also eat insects and, occasionally, a small mammal. Prickly pear and manzanita fruit, mushrooms, and dandelion flowers are also part of their diet. The critters sport large cheek pouches that come in handy for carrying food to the storehouse. Chipmunks’ cheeks are so elastic that the paired pouches of one critter can hold more than a thousand seeds – or a half-dozen acorns. Even when it appears that a chipmunk is swallowing food, it may actually be holding the goodies inside its pouches. The chipmunk places the food into its mouth with its “hands” (forepaws) and pushes the food into one of the cheek pouches with its tongue. The only real evidence of what’s taking place is what looks to be a sudden case of the mumps. Most chipmunks nest in subterranean burrows. Solitary except during the breeding season, a young chipmunk starts out with a sleeping chamber, a storage room, and a latrine, all connected by passageways that lead to one or two exits. If the animal lives out its four-year lifespan, it will enlarge its burrow by adding more rooms and entrances. Weasels are the chief foes of chipmunks, because these predators’ narrow bodies can scuttle deep into the burrows. That’s why a chipmunk needs several escape routes. While the chipmunk exits the burrow by one route, he counts on the weasel to take another. Outside their burrows, chipmunks are preyed upon by coyotes, hawks, and other carnivores. Spring and early summer are chipmunk breeding seasons. In some areas, chipmunks raise two litters annually. A brief pregnancy, 30 days, followed by 30 days of nursing, leaves the females with enough time to start all over again. Autumn brings a flurry of chipmunk activity. The early brood of youngsters are out of their burrows by this time and can be seen chasing each other around, while the oldsters are busily storing up food. Every acorn, every seed, every pine nut is welcome. There’s a long cold winter coming, and survival means being prepared. Because chipmunks are such charming and willing panhandlers, you may be tempted to feed them. Resist the urge. Even campground chipmunks are wild animals. When they bite, it hurts – and they could conceivably be rabid. And chipmunks may have fleas. In the West, those fleas may carry bubonic plague. Although it’s rare for humans to become infected, a few cases are reported each year. Finally, consider that a fat, lazy chipmunk is easy prey for predators. Protect yourself and the chipmunks by enjoying them from a distance, and don’t encourage them to share your food.